The man was pushed into a rock pool on Scarborough's South Bay. A man was pushed into a rock pool in Scarborough's South Bay after getting into an altercation. 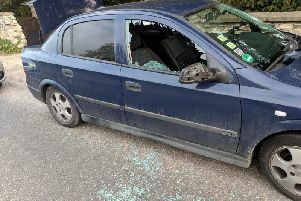 North Yorkshire Police today issued an appeal for witnesses to the incident which took place on Tuesday, June 26. It involved a man being pushed into a rock pool following an altercation with an unknown man. "In particular, we are appealing for information about the man involved." The man is described as being white, approximately 5ft 8in and stocky, with short, dark hair. He was thought to be around 45 years old and was very tanned at the time. The man was walking a German Shepherd/Alsatian-type dog with a long yellow lead. Anyone with information is asked to email zachary.waterman@northyorkshire.pnn.police.uk or contact North Yorkshire Police on 101, select option 2, and ask for Zac Waterman.